Patchwork House (a local fabric store) is having a sale this weekend (25% off all fabrics! 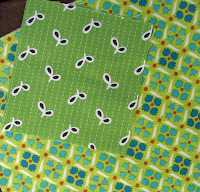 ), and I was very pleased to pick up these two favorites fabrics. The Russian Dolls are manufactured by Cosmo Textile Co (Japan), and the dot fabric is my all time favorite dot from Aunt Grace Polka Dots by Judie Rothermel (Marcus Brothers Textiles). UPDATE: The Bird fabric is now on the way to Washington, swapped for some FMF posies! Hooray! My stash of these is almost depleted. If you are willing to swap either of these two fabrics please email me. Oooo, I love those Russian Dolls. I have plans to one day make a quilt for my (now) 3 year old daughter and I love Russian Dolls (still) so that might be theme that would grow with her whilst still being girlie for now (or whenever I actually get around to making it!!). 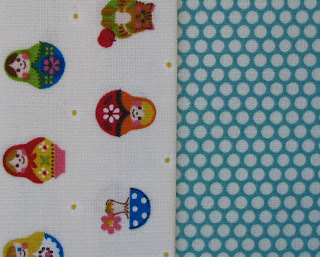 I love that Russian Doll fabric, just adorable. I did have some of both of the green fabrics, but I think I used it all. If I have any left, I will let you know. Oh, I hope someone can help you, Rita - I know how sad it is to reach the last little bit of some fabrics! 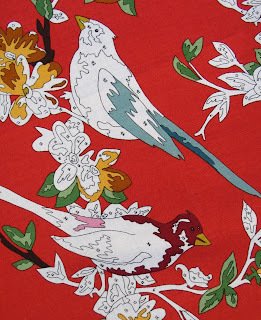 I so love the bird fabric but sadly have no flea market to trade it for! If only I had those fabrics you're after I'd be happily swappering for your birdies. Heartily agree with you on the dot. Perfect ratio of dot and non-dot. Great fabrics Rita! You never put a fabric foot wrong! I know that a lot of people are looking for that paint-by-number bird print! I think I recall that Ashley at http://www.filminthefridge.com/ was looking for some a while back; not sure which colorway though. Good luck! Last week my fabric store had tons of that bottom Flea Market Fancy (Medallion Grid?). You want more than a fat quarter? It's a discount fabric store, so very reasonable- I doubt it's more than $6/ yd. Would you like me to get you some?? oh the dolls....too sweet! Good lick with the seed search! Hi Karen - thanks for leaving a comment - I would love some of the medallion Flea Market Fancy Fabric, please could you email me so that we can sort out the details. I don't have your email details. I just wanted to say I think the Bird print is actually by Erin Michael, not Urban Chicks. I'm not a huge fan of the Lush line, but I do love the red birds from it. The red is just so vibrant!